This week, LeBron James created a media storm after unfollowing his own team on social media (disrespect or some kind of inspiration strategy? ); Nate Robinson is looking to pursue a career in the NFL; and Anthony Davis has been shut down for the rest of the season after undergoing successful knee surgery. D.J. 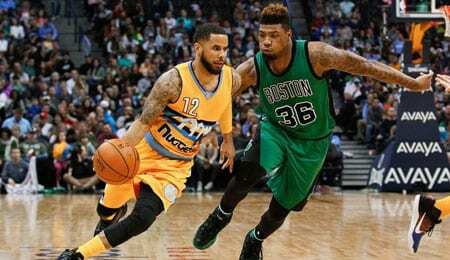 Augustin, PG, Denver Nuggets (ESPN: 29.4 per cent; CBS: 35 per cent): Though the eight-year vet has bounced around a ton since leaving Charlotte, no matter where Augustin goes he brings a ton of value with him. Landing in Denver at the trade deadline, he’s proved himself to be one of the most reliable reserve guards in the league from a Fantasy perspective. Augustin will dish out a bunch of assists and knock down a couple of treys per game (sometimes, even from halfcourt — see video below), so could wind up being the most reliable reserve guard on your team. Toney Douglas, PG, New Orleans Pelicans (ESPN: 32.4 per cent; CBS: 26 per cent): Douglas has racked up a ton of minutes and impressive stat lines over his last six contests. His most efficient one came in a Sunday victory against the Clippers as he produced 15 points, nine assists, seven boards and a steal in 37 minutes. Whether Douglas’s production is affected by the return of teammate Norris Cole or not, he’s shown what he can do in the likes of absences and may receive a bigger role in New Orleans. Jerami Grant, SF, Philadelphia 76ers (ESPN: 20.4 per cent; CBS: 50 per cent): Grant has been on a progressive climb since a two-game absence. He has now scored over 10 points in four of his last five games and is averaging 30.6 minutes over that stretch. Grant is versatile around the scoreboard, and hopefully could provide you with all the extra production assistance your team needs. Luke Babbitt, SF, New Orleans Pelicans (ESPN: 2.4 per cent; CBS: 4 per cent): Babbitt generated a season-high 23 points and four boards during a loss against the Heat Tuesday. It seems he’s capable of scoring given ample minutes, and may get just that with Davis out for the season and Ryan Anderson playing on thin measures. Salah Mejri, Dallas Mavericks (ESPN: 17.6, CBS: 18 per cent): Mejri has racked up two double-doubles (points/rebounds) in his last three games. Though he has received two straight starts, his role a starter is still washy due to the lingering presence of Zaza Pachulia. Still, with these numbers alone, Mejri is worth owning for an immediate impact in points and rebounds. Omer Asik, New Orleans Pelicans (ESPN: 17.8 per cent, CBS: 25 per cent): Apart from his rebounding ability, Asik doesn’t offer much Fantasy upside. He does, however, provide the occasional scoring boost, which could end up giving your team the sporadic double-double to enjoy.